Many people have heard the story of Mr. Stubbs, the tailless alligator that got a new tail (and a new lease on life) through the wonders of 3D printing. But before his prosthetic tail was printed, the project stakeholders had to undertake a scanning process as well. Engineering.com talked to two of the project stakeholders to get the details on how exactly the scan happened. While Georgi had a 3D scanner in the office, the quality wasn’t high enough to capture the detail of an alligator’s tail. So, he reached out to 3D printing company STAX3D to see if it wanted to collaborate on crafting a new prosthetic for the injured reptile. “When Justin initially contacted us, we were very intrigued and weren’t sure what we were getting ourselves into,” said Michael Andrew, technical lead at STAX3D. While STAX3D had worked with prostheses before, this project would be its first non-human prosthetic. The team started by reviewing the “cast tail” (a dead alligator’s tail that Georgi’s team had used as a model for previous prostheses and scanning it from multiple angles). To scan the tail, STAX3D used an Artec Eva structured light scanner, a scanning device that allows you to map out the surface of an object using projected light. The light bouncing off of the surface is distorted, and when that distorted light gets picked up by the scanner, the distortion is used to identify the object’s shape. 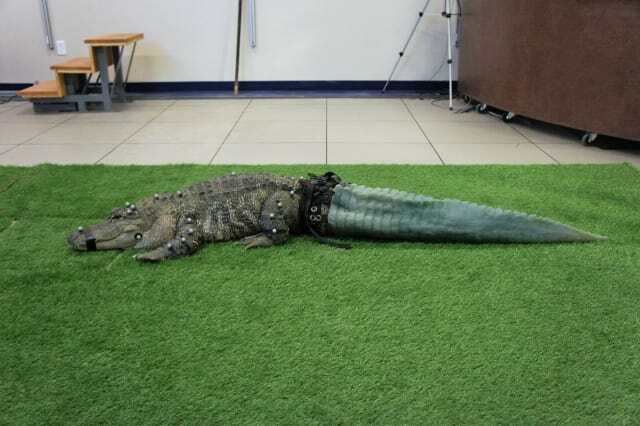 The Artec Eva was ideal for this particular project because it’s accurate enough to capture detail within 0.5mm (0.019685in), and can be used on large objects, including an alligator’s enormous tail. Using the scanner, the team was able to create a point cloud of the tail: a set of 3D points that, together, form the surface of an object. The point cloud was run through Artec’s software to develop an STL file, a model that stitches the points together into a coherent whole. That file formed the basis for the later 3D-printed tail.